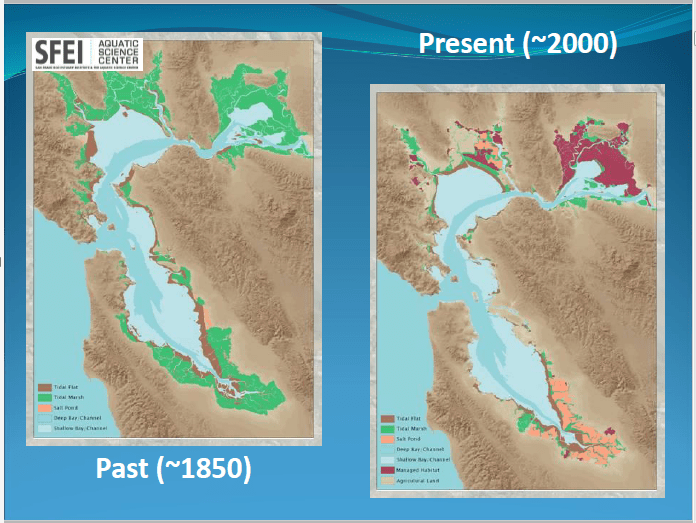 San Francisco Bay, much like the Delta, has lost an estimated 85 percent of its historic wetlands to development and other human uses. 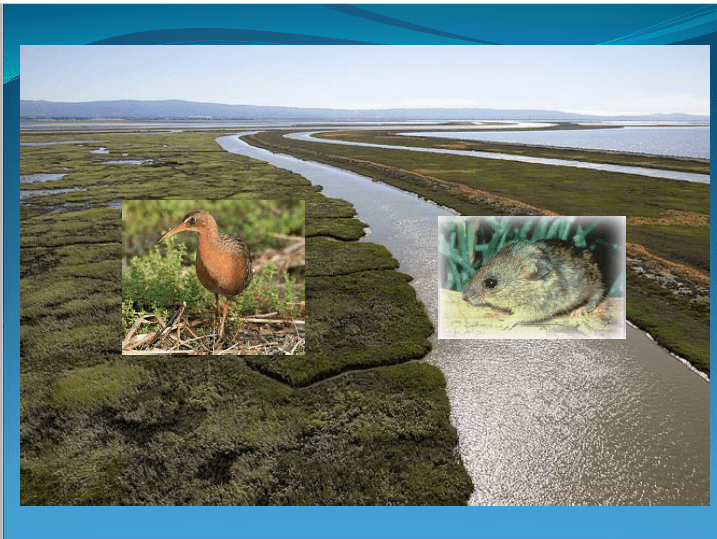 The dramatic decline in tidal marsh habitats has caused populations of marsh-dependent fish and wildlife to dwindle, as well as impairing water quality and increasing local flood risks. 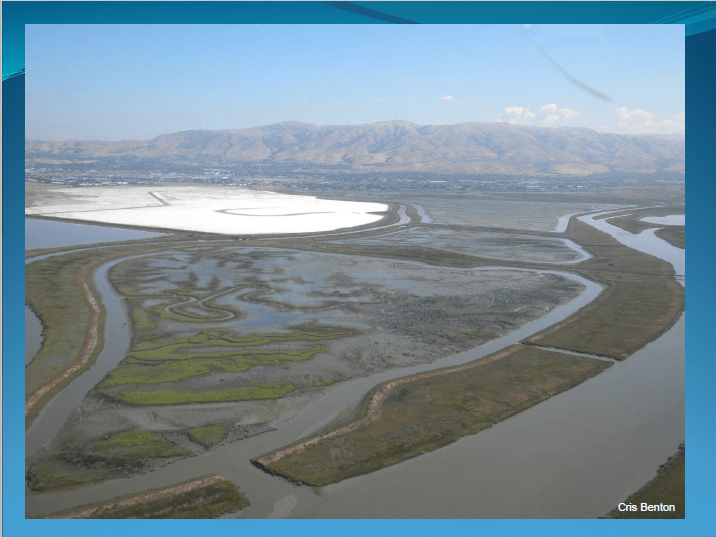 The South Bay Salt Pond Restoration Project, when complete, will restore over 15,000 acres of industrial salt ponds to a mix of wetland habitats in the south San Francisco Bay, while also providing for flood management as well as wildlife-oriented public access and recreation. 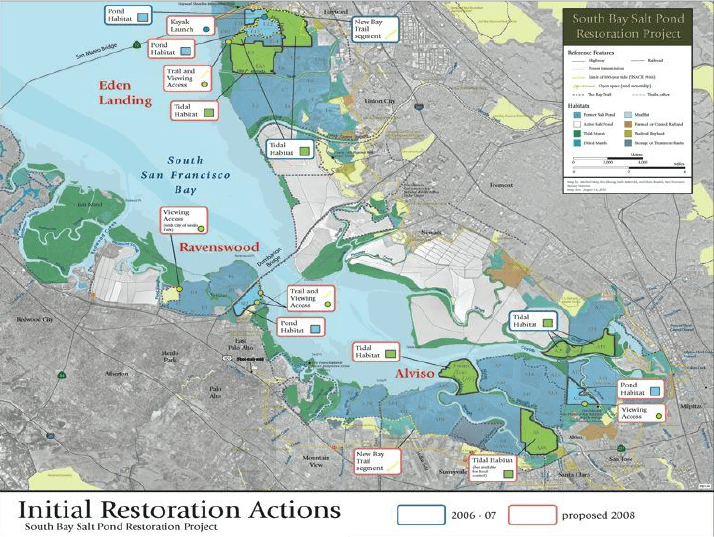 It is the largest tidal wetland restoration project on the West Coast, and part of a larger effort to restore 40,000 acres of tidal wetlands to the San Francisco Bay. 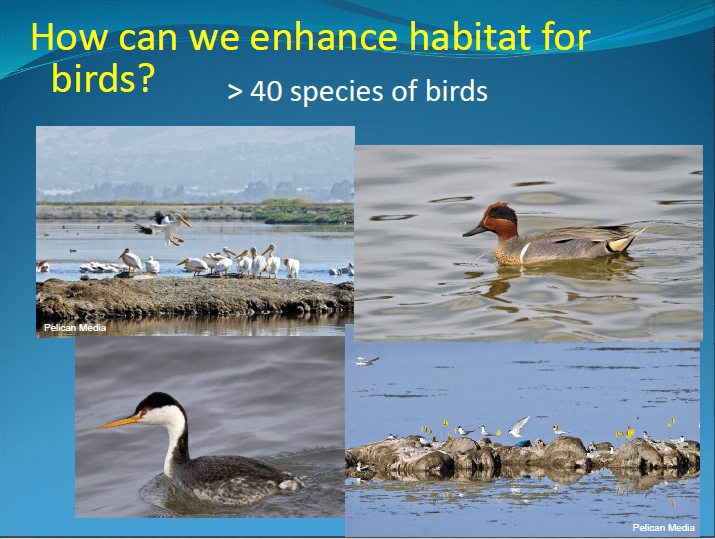 The lessons learned will provide working examples for an adaptive management framework in other large habitat restoration projects such as those currently planned and in-progress in the Delta and Suisun Marsh. 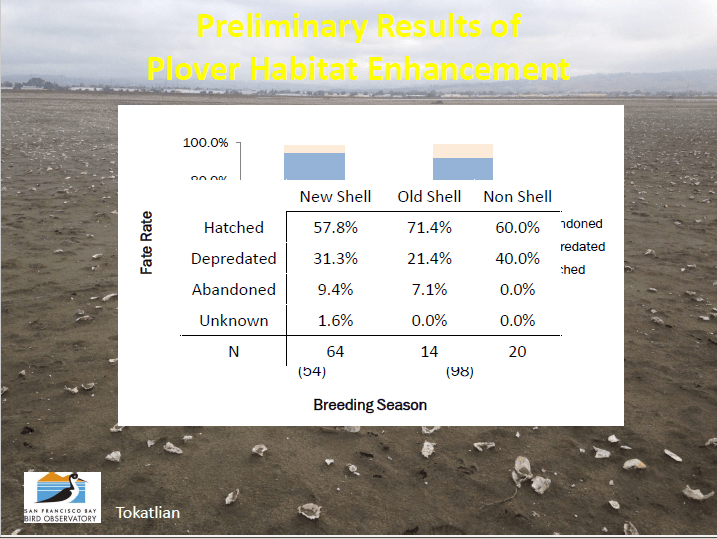 The project will be implemented in phases over the next 50 years, with the plan allowing for scientific information gained from earlier phases and applied studies to be incorporated as management objectives and designs of future actions are revised and implemented. 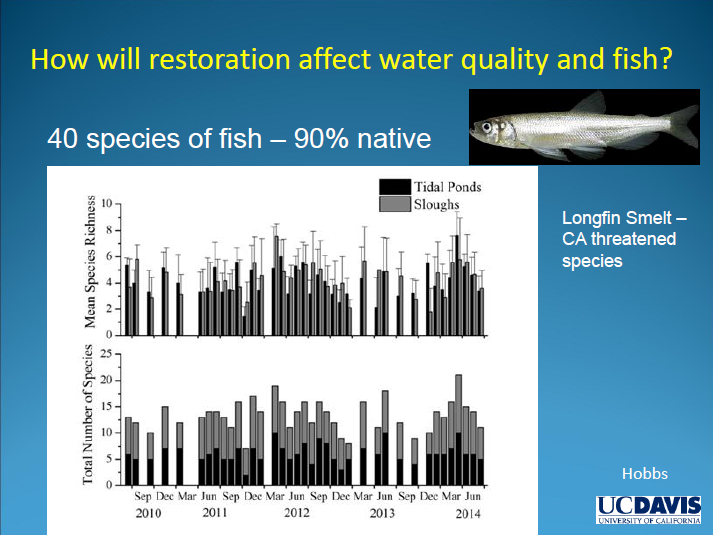 In this brown bag seminar jointly presented by the Delta Science Program, the Ecosystem Restoration Program, and the Surface Water Ambient Monitoring Program, Lead Scientist Dr. Laura Valoppi focused on the restoration process, summarizing the results of some key studies and how managers have revised management actions and restoration designs in response to scientific research. 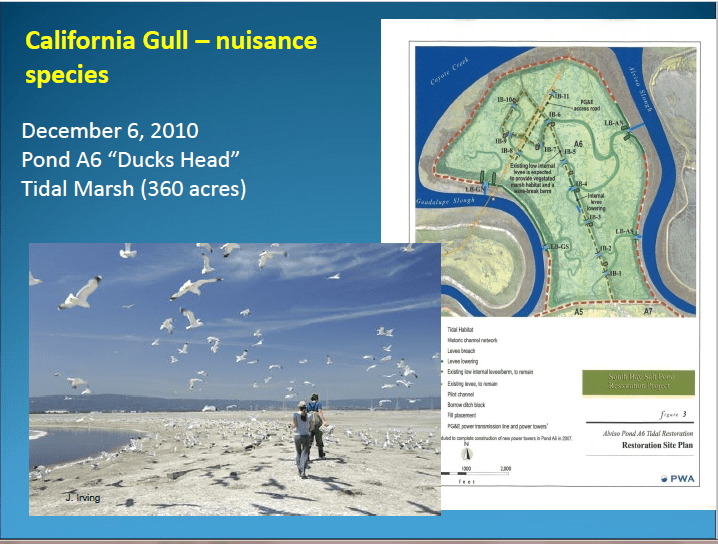 Historically, there was much more tidal marsh surrounding the bay than is existing today. 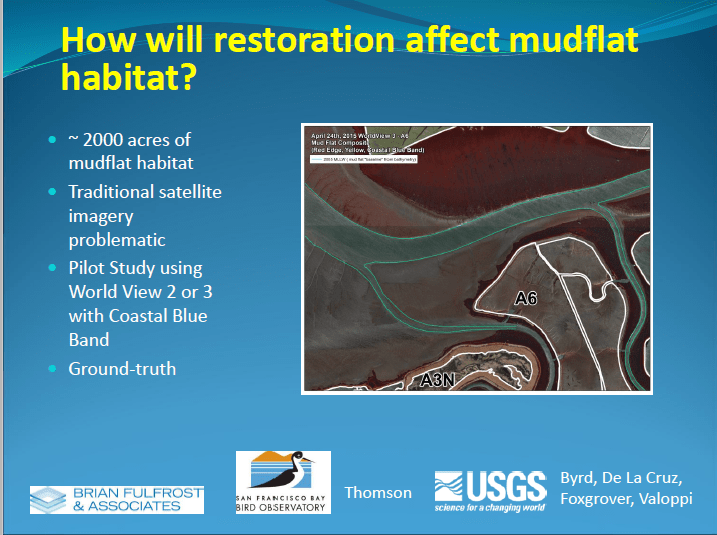 Dr. Valoppi presented a slide showing how things have changed over the last 100-150 years, noting that the green is tidal marsh and the brown is mud flat habitat; she noted that the mud flat habitat was prominent in the South Bay and still exists. 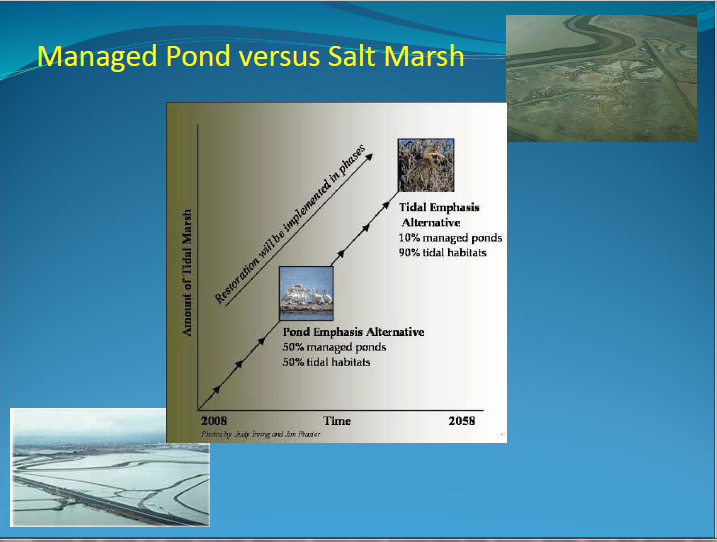 The pink in the graphic on the left signify where the marsh was diked off and evaporative salt ponds put in. The project encompasses approximately 15,000 acres split across the three complexes, which together are essentially the same size as Manhattan; the area shown is gray is still under salt production and is not included in the total acreage. 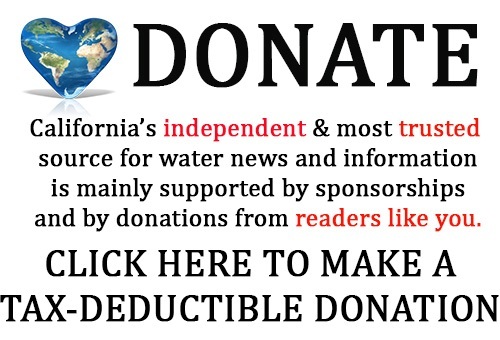 The land was acquired in 2003 for $100 million through a public private partnership that included the state, the federal government, and a consortium of Silicone Valley- based foundations. 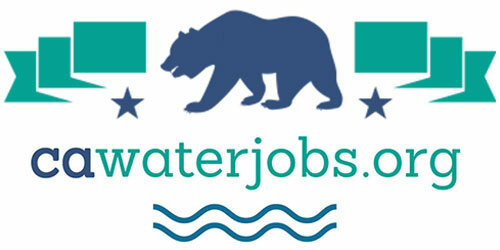 The restoration project is a partnership between state and federal agencies and NGOs. 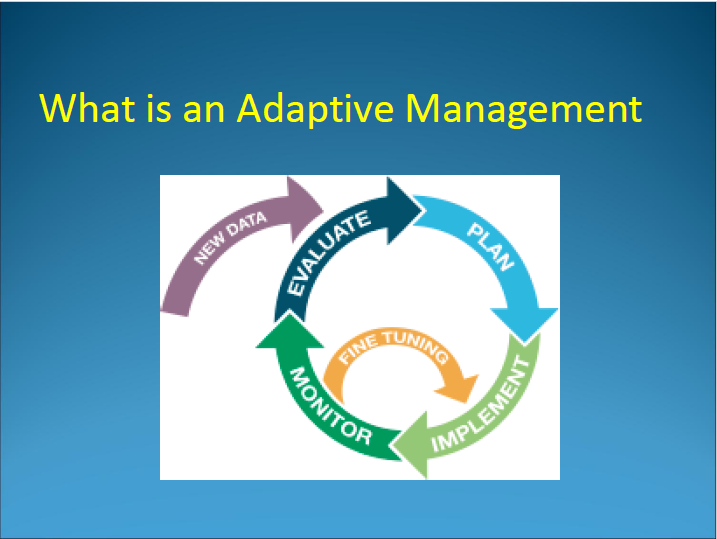 “This is the adaptive management cycle,” she continued. 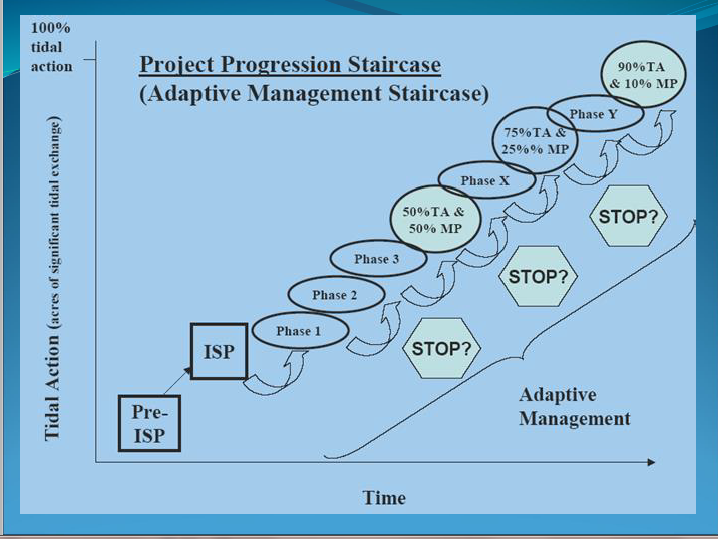 “You plan, you have an idea of what you want to do – a restoration action or an enhancement project; you implement that project, you monitor it, you might do some fine-tuning in the middle as needed, and then you evaluate the monitoring results, maybe bring in new data on that species or other factors, and then you start the whole cycle again. You plan, implement, monitor, evaluate. So in phase one, that’s what we did; we’ve learned those lessons, we’ve moving into phase two. 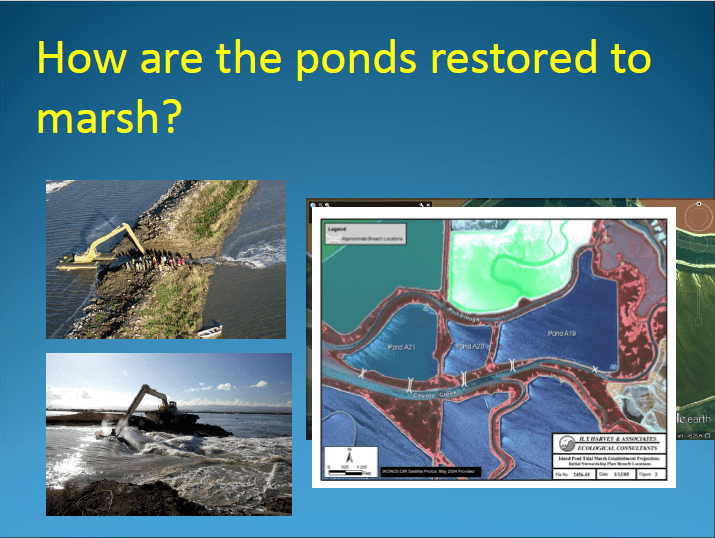 We’re going to plan, implement, monitor, evaluate again, and we’ll do that in phase three on the cycle.” Since the restoration project is 15,000 acres, it can be broken down into smaller projects instead of having to do all the acres as once, she noted. 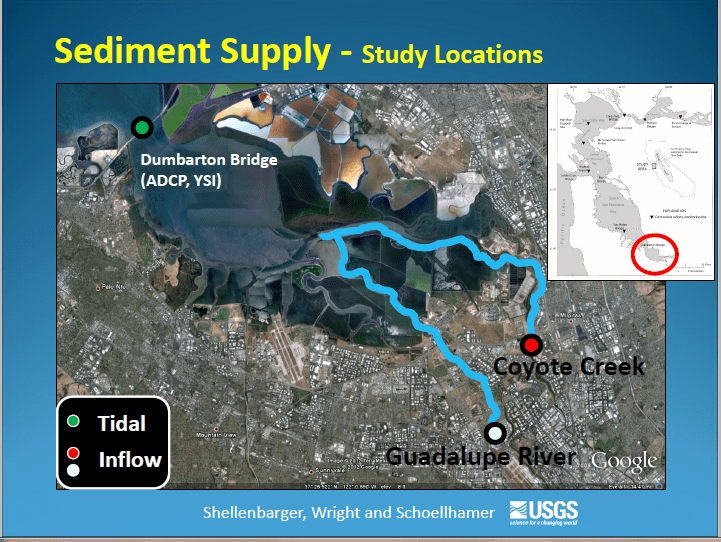 Studies were done to look at sediment flux coming through the Dumbarton Narrows underneath the bridge, as well as sediment coming in from the two main tributaries in the South Bay, the Guadalupe River and Coyote Creek. 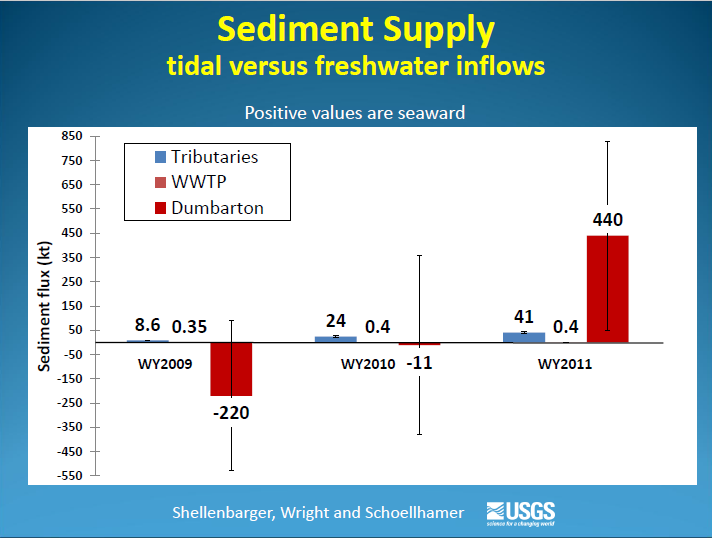 Dr. Valoppi presented a graph of the results for the first three years, noting that sediment flux in kilotons is on the y axis. 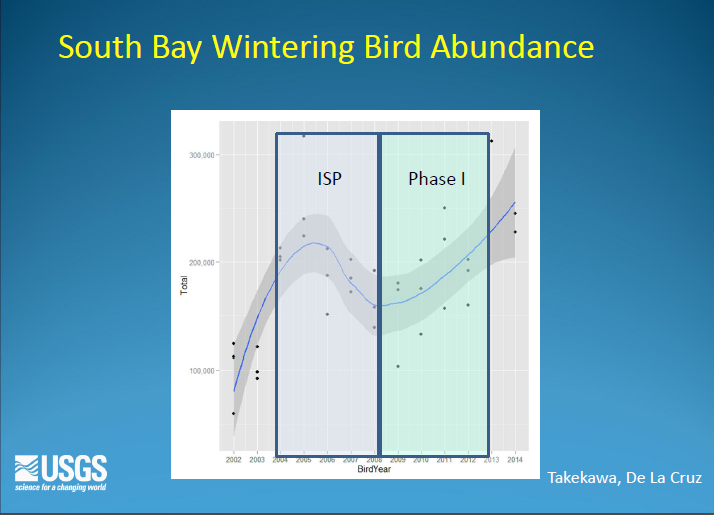 On the chart, positive numbers mean that the net sediment flux is seaward or away from the project area; negative numbers mean that there’s a net sediment flux toward the project area in the South Bay. Red is what’s coming through tidally at the Dumbarton Narrows and blue is what’s coming in from the tributaries. 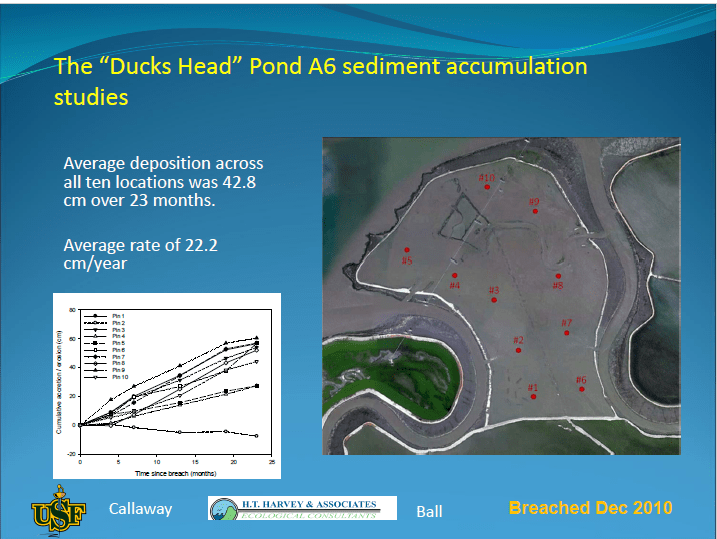 Sediment studies were done on two projects were ponds have been breached, the Island Ponds were breached in 2006 and the Duck’s Head pond, which was breached in 2010. 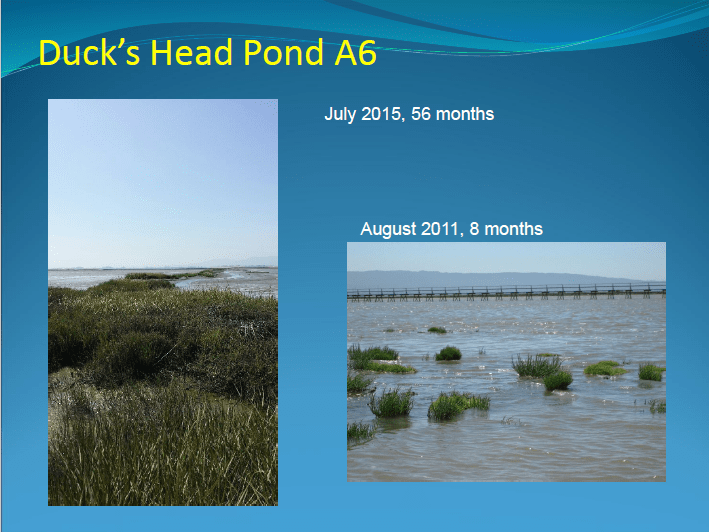 The other pond studied was Duck’s Head pond, which was breached in 2010 in four locations. 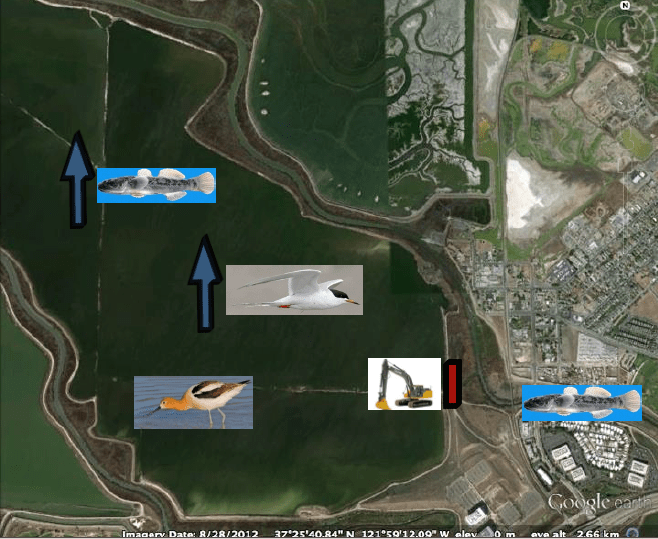 It is about 350 acres; ten locations within the pond, noted by the red dots, were used to track sediment accumulation. 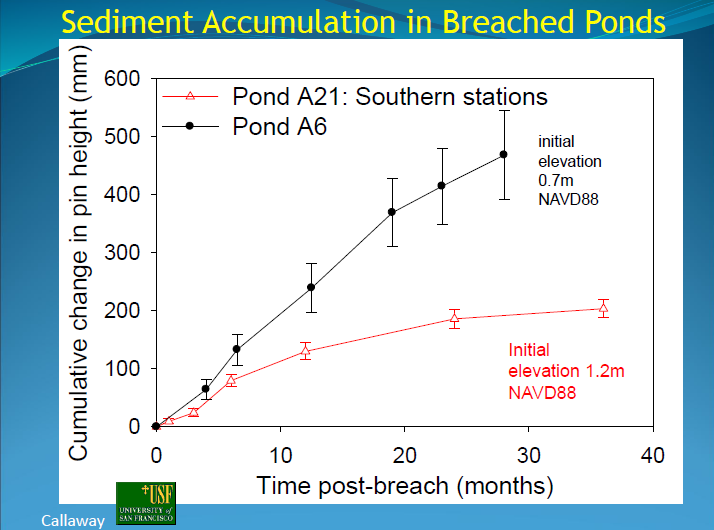 The graph shows time since the breach on the x axis, with sediment accumulation at the ten locations on the y axis. 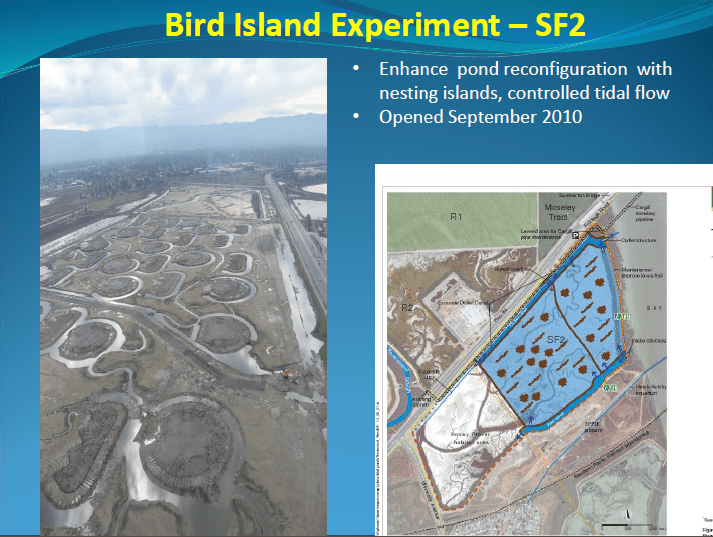 “This is what it looks like at various periods afterwards; it’s developing nicely, but all the sediment pouring into the ponds and filling up makes us concerned about what’s happening to the mud flat habitat or shoals,” she said, noting that the project area has 4,000 acres of mud flat. 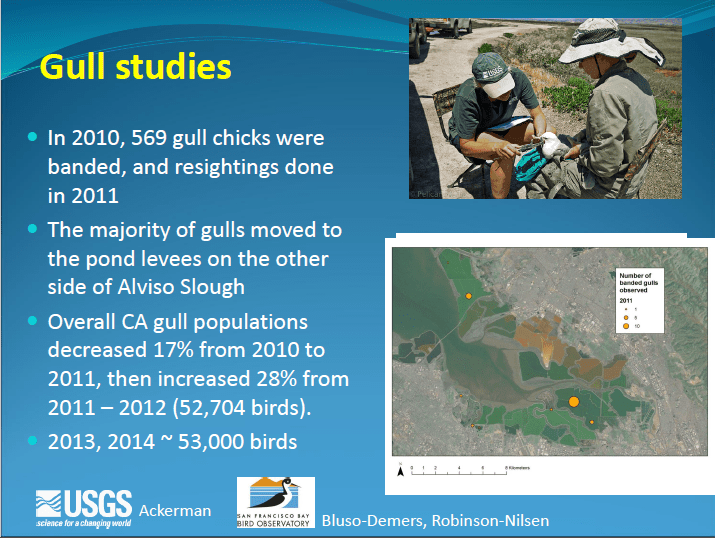 Dr. Valoppi said using traditional satellite imagery is problematic for a lot of reasons she wouldn’t go into, but last year, they did a pilot study using the satellite World View 2 which charts water better than some of the traditional satellites; some ground truth was also included. 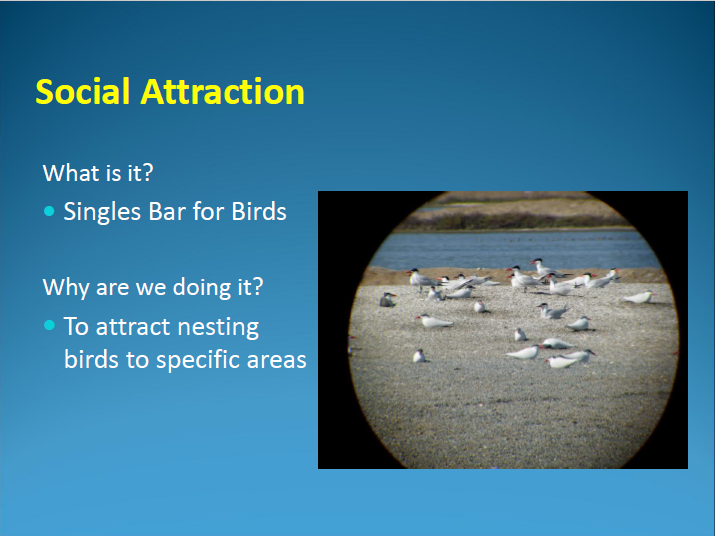 Dr. Valoppi then turned to discuss the work being done to restore and enhance habitat for birds. 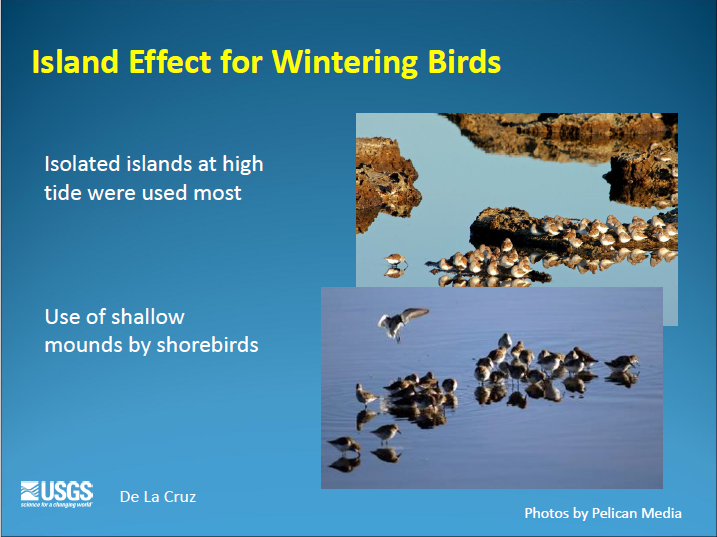 There are over 40 species of birds – shore birds, ducks, diving ducks, pelicans, and some breeding birds; most of the birds, however, are wintering here or coming through in the fall or spring migration. 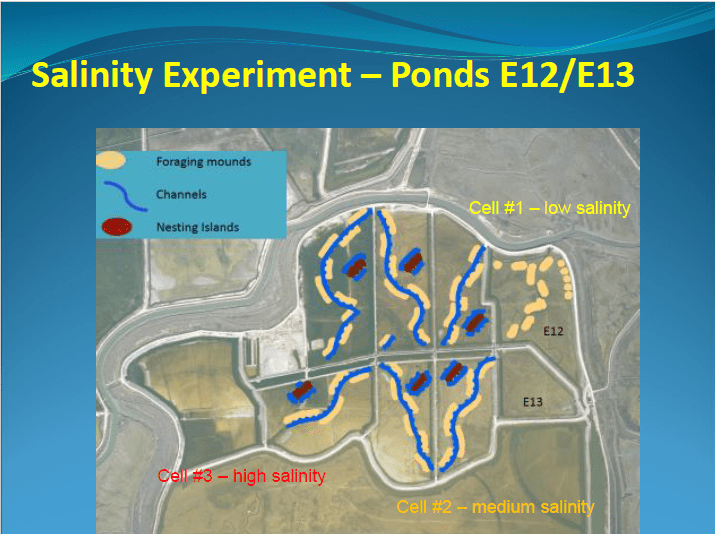 There are two different cells with islands; there are water control structures for inflows and outflows, as well as several water control structures to control the depth and the timing of the water. 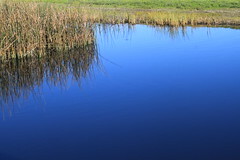 The refuge brought a amphibious piece of equipment called a Marsh Master, which went on to each of the islands and broke up the surface to eliminate the cracks. 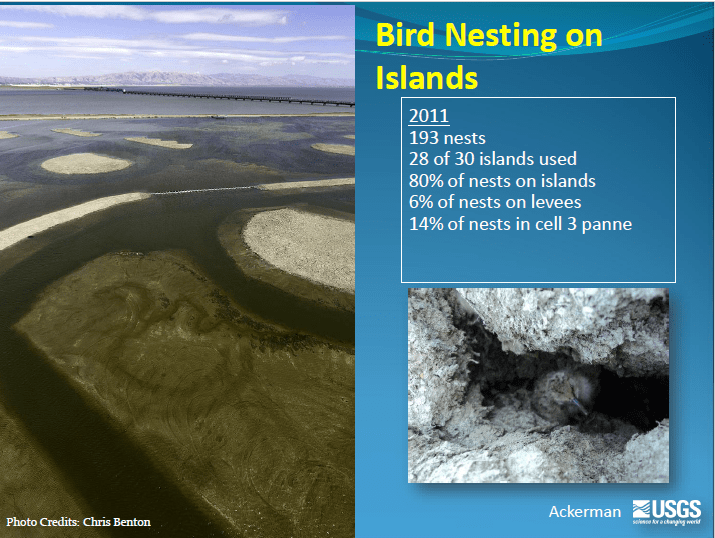 The next year, there were only 68 nests, and very few of the islands were used for nesting. 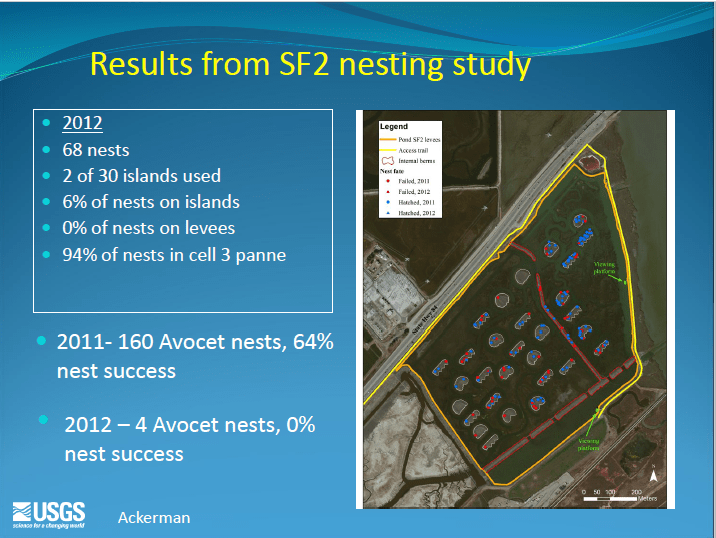 “So three of the islands were prepared; there was about 50 decoys, and a solar operated call system was set up in the FS2 island; in A16 we set up two of the islands with Caspian tern. 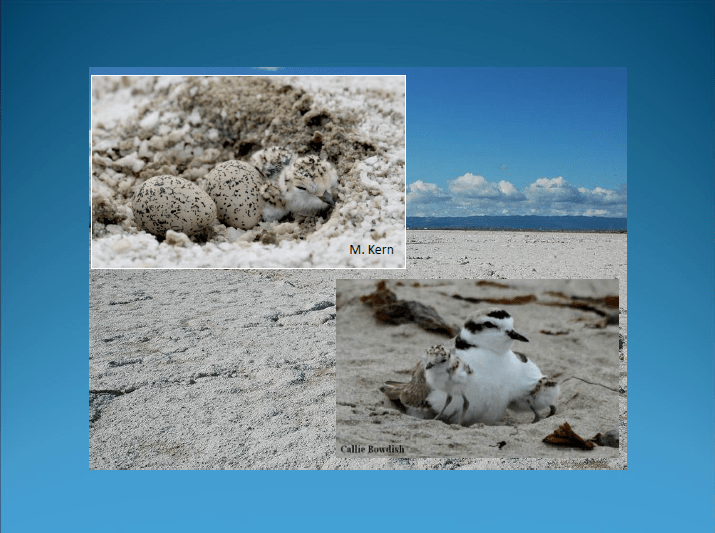 We also tried this in a limited extent for forester terns and clovers, but the focus was really for Caspian tern,” she said. 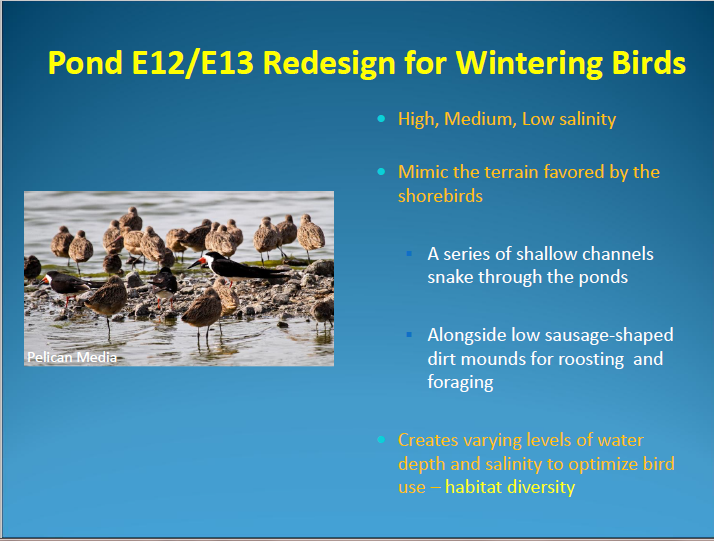 She presented a design of the project, noting that there is a matched pair of low salinity cells, medium salinity cells, and high salinity cells in both ponds. 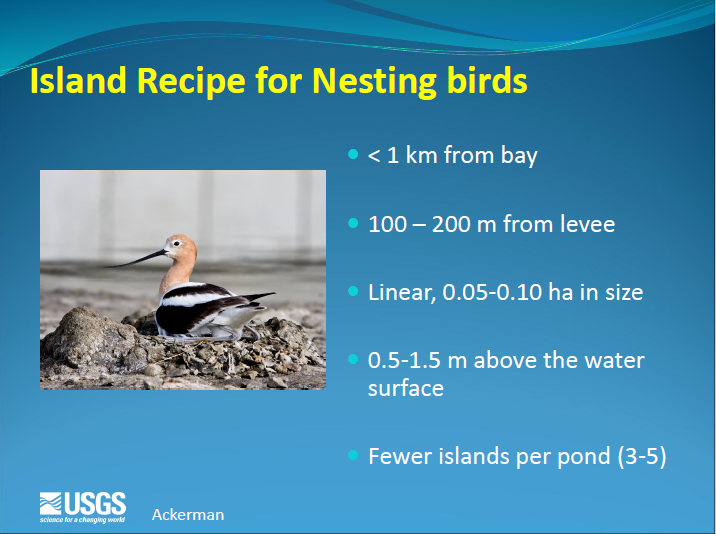 The water comes in and is moved through a series of water control structures to control the amount of salinity, and then nesting islands were added, just one per cell. 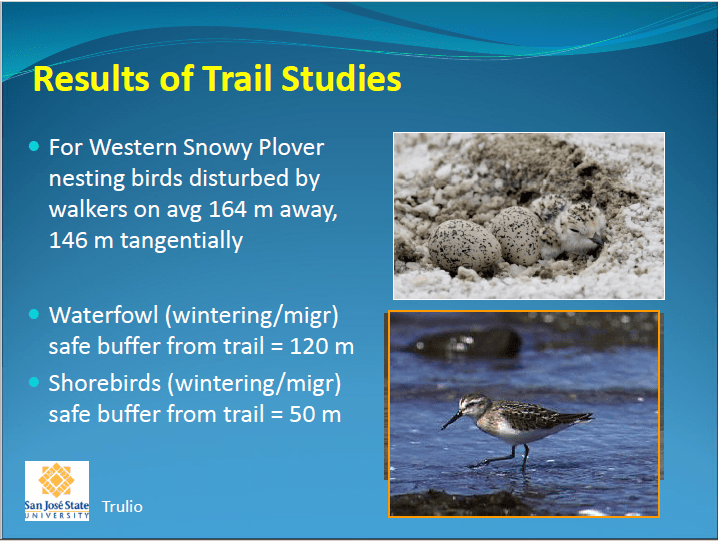 They are linear because they’ve learned that the birds favored linear over round. 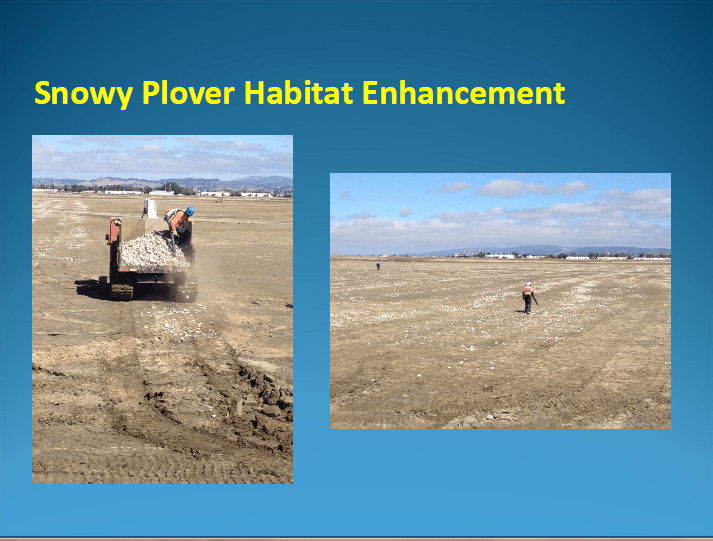 The shallow channels were added, shown in blue, and that material piled up to create the shallower habitats. The New Almaden Mine began operations in 1846 in the hills above south San Francisco and was one of North America’s most productive mines, producing over 1 million flasks during its span of operations. The mine drains to the Guadalupe River, which is upstream of part of the project area. 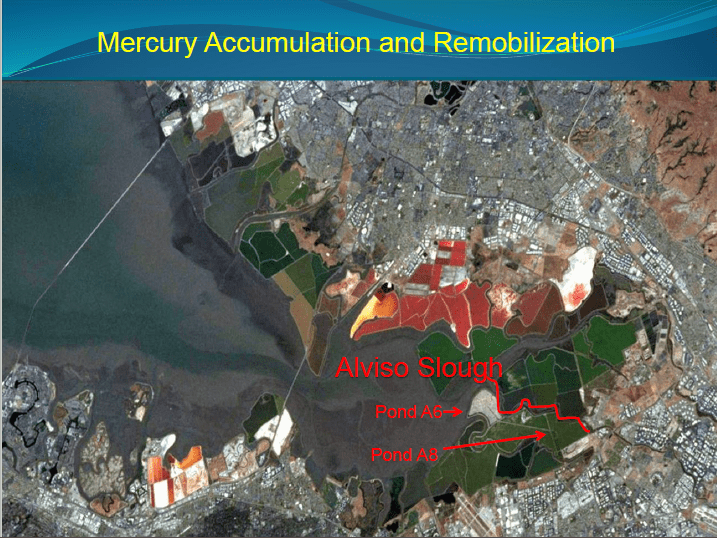 So they set up a mercury experiment in Alviso Slough, which is connected to the Guadalupe River. 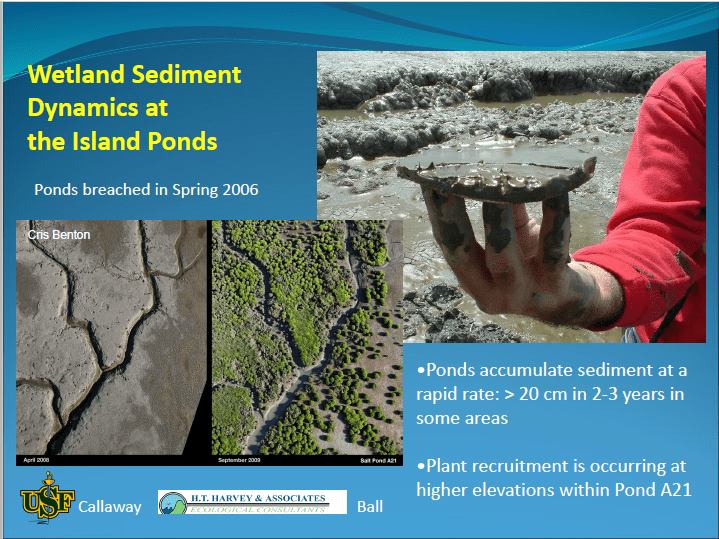 The New Almaden Mine historically had washed down contaminated sediments down the river and into the project area, and with the rains, more sediment continues to comes down through the upper watershed into the project area. 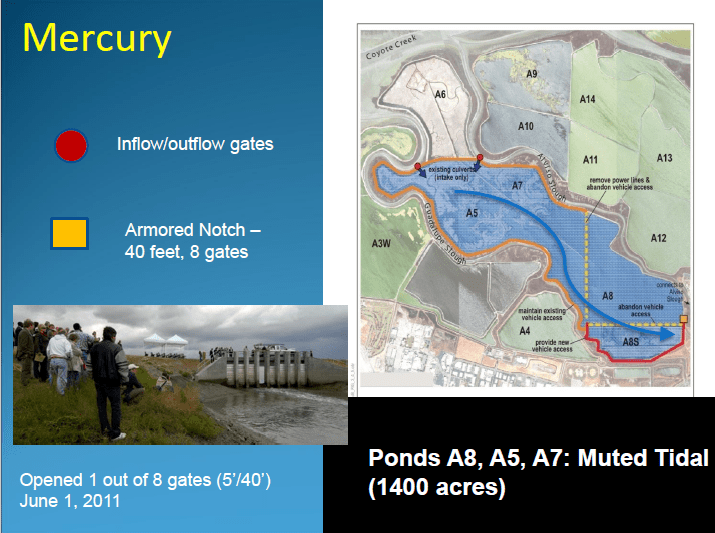 “The idea here was to control the amount of water and the timing of the water that we put into this pond operated as a muted tidal flow, and then check to see what effect that has on mercury,” she said. She explained the infrastructure of the project, noting that there are eight bays and eight gates. 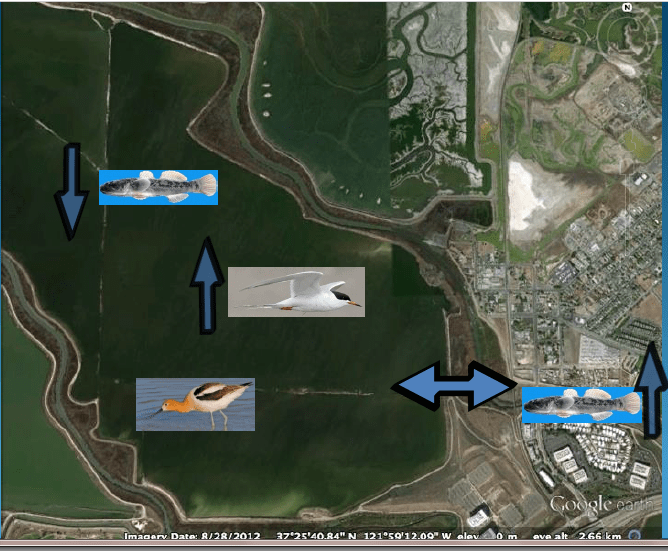 There are concerns about climate change and sea level rise and the effect on the biology and habitats of the entire San Francisco Bay and Delta, as well as specifically on the restoration project, and how managers can adaptively manage to ameliorate the effects. 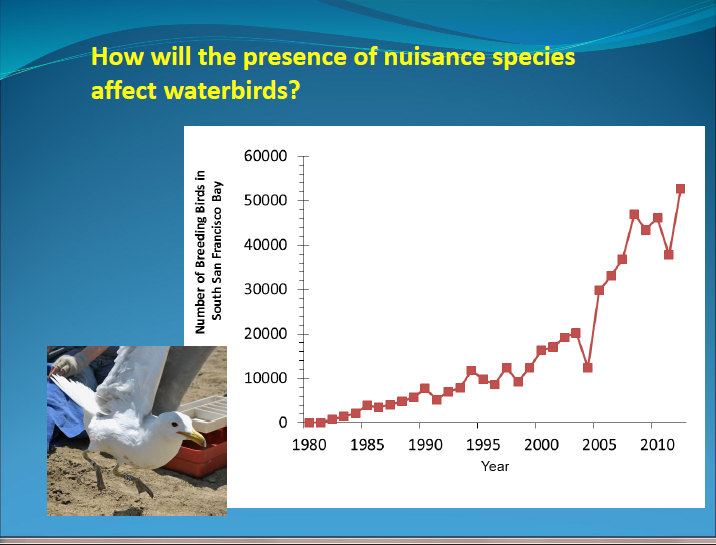 Dr. Valoppi then concluded her presentation with a nod to the project’s entire science team’s hard work and dedication. The floor was then opened up for questions. Question: Do you know how much of your material is organic versus inorganic? And where is this inorganic material coming from? 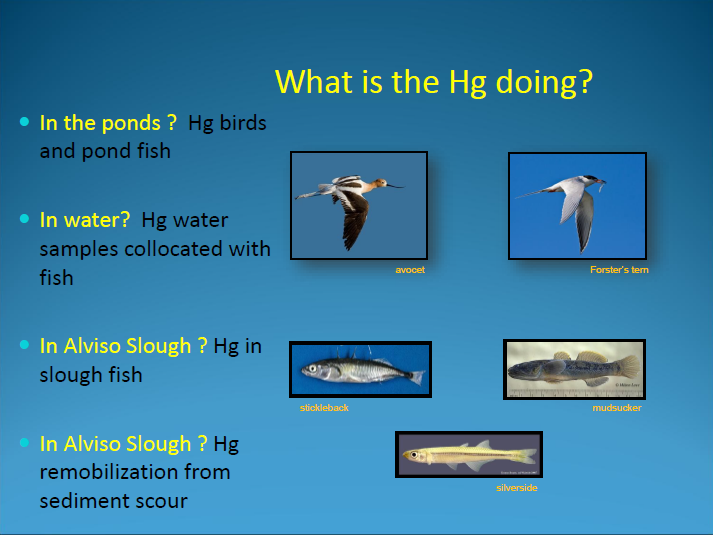 Question: How do all these entities and interdisciplinary people working on birds, hydro analysis, people that know about sediments – obviously they have a lot to say to each other. How do you guys interact? 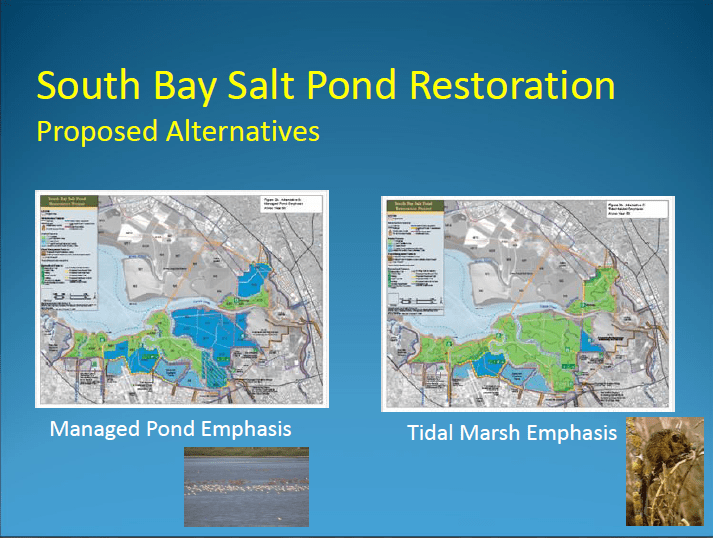 Click here for more on the South Bay Salt Pond Restoration Project website. 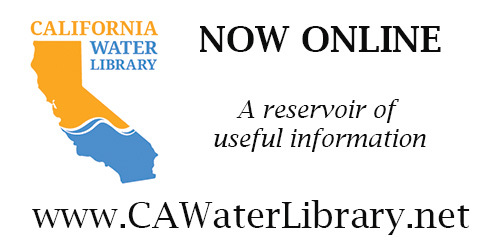 Click here to watch the video of this brown bag seminar.